Homeowners looking to integrate the latest entertainment technology into their home, without sacrificing the clean look or design of their house, are increasingly turning to AV integrators to provide a solution. Often limited by entertainment systems’ wiring and how it must be integrated, wire concealment has become a fine art among pros. Multi-room, multi-device installations are particularly tricky. Traditional cable runs are often impossible, as sealed walls cannot be opened up to distribute sound across the varying locations. That said, it should come as no surprise that the demand for solutions that eliminate the hassle of running wire is surging. Going wireless is the obvious choice. And, given wireless audio’s consistent category growth, the industry is seemingly embracing it. But for custom integrators, going wireless has historically presented a multitude of challenges. Robust wireless signals are often lacking and wireless is intrinsically not as reliable as copper wire in residential audio installations, especially when going across multiple zones. While not a typical solution in the professional integration space, Bluetooth could be used in some cases. However, as it is a relatively low power solution, Bluetooth is best used only in short distance or single room applications. Spread Spectrum techniques create a much more robust link and are used to deliberately spread the frequency domain of a signal from its narrow band domain. With increasing resistance to natural interference and jamming, spread spectrum solutions are a popular option among wireless systems. Advanced systems also use Frequency Hopping Spread Spectrum (FHSS) techniques. This allows sharing of a frequency band with many types of conventional transmissions with minimal interference (i.e. Wireless Phone, Wireless, etc.). Frequency hopping patterns are determined once the TX and the RX link up and can include up to the 79 Channels available within the spectrum. Distributing sound throughout a home or business is a concept as old as intercom systems, but when multi-speaker surround sound systems became widely available, the demand for high-quality distributed audio increased immensely. Like most technology, multi-room audio distribution began as a wired solution. Wired audio systems boasted reliability that, until now, has not been available to integrators in any alternative option. However, cabling multiple zones is far from an ideal solution. Challenges include cable length limitations, in-wall obstacles like insulation, studs, AC cables, water pipes and more, slab foundations, cathedral ceilings and last but not least, sealed walls – meaning more often than not, wired systems are costly and time-consuming installations. Current market wireless audio systems overcome the installation challenges, but because most are one-and-done solutions, it is extremely difficult to implement multiple zones of audio without multiple head units. As additional systems are added, chances of Wireless signal interference increase and integrators are left to custom setups and configuration to meet reliability standards – once again, resulting in a costly and time- consuming installation. Today, “wireless audio” products are generally either a countertop amplifier/ speaker with internet access and Apple or Android user interface, or at least a source device with Apple or Android control and Internet source access, which still requires a distribution amplifier. The customer must have this speaker box in plain visible sight, and be tied to the quality of sound the speaker box has. When thinking of the majority of wired and wireless distributed audio products on the market, building out a new custom system is oftentimes the key to delivering amazing sound across multiple zones – especially when retrofitting a preexisting audio system. When designing a custom solution, many pros look for a system that allows the transmitter to be mounted in a rack or sit inside a credenza, and the amplifier and wiring to be hidden inside a wall cavity so equipment clutter can be kept to a minimum. Depending on the configuration that’s required for the job, it is imperative to have a system capable of providing multiple input options, including a combination of mono channels and stereo pairs to help meet multiple uses – such as additional zones and added surround sound. To ensure reliability consistent with wired solutions, a solution that offers an independent wireless network is best. This will help reduce interference from existing networks and provide a secure environment to stream audio to multiple zones. A system that relies on an existing network might require an upgrade to the network to provide adequate coverage of the operational area. This too becomes one more variable for potential problems in audio reproduction. Certainly there are many grades of wireless audio equipment available. Some on the more cost effective side, some on the pro quality side. It is important that the chosen system has robust features that the professional installer is used to having. On the wireless operation, features like Forward Error Correction, which is essentially 2-way communication between the transmitter and receiver, ensures no crackles or pops happen when the signal weakens. Latency is a byproduct of error correction, and the lowest latency possible is also very important. In addition, there should be no latency from speaker to speaker (or amplifier to amplifier). The amplification should also have high quality features, such as Under Voltage protection, Short Circuit protection, Overload protection, Overtemperature protection, and stand-alone protection recovery. 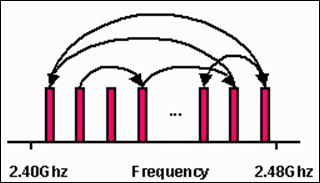 Digital audio is made up of bits of information that is sampled at a given frequency. In the simplest terms, the digital chip takes “snapshots” of the original audio at a set frequency to a limited bit depth. A high quality audio system should be able to reproduce sound at 16-bit depth, 44.1kHz sampling rate. Integrators are limited in their installation options when it comes to wireless transmission systems – on- wall or in-wall. Oftentimes integrators are dealing with retrofits and as such, these limitations become even more challenging. By selecting a system that allows for both installation options, integrators can select the appropriate option for the home’s configuration. By avoiding cutting drywall and running multiple speaker wires, integrators are provided more freedom and can create time efficiencies. Thus, the overall job costs are lower to the end customer, and the time on site is much less, allowing for more projects in a given day. It is important to note wireless audio systems code and ratings for both home and commercial applications. Selecting a highly-rated product, including those that are FCC, LVD and UL-rated, can help give an integrator peace of mind that they are installing a quality solution no matter the application. In addition, either home or business may require plenum rated equipment. NFPA defines a plenum area in simple terms as any enclosed space which has air moving. Thus, UL 2043 Plenum rated equipment, including wire, and tie wraps is capable of being installed in a plenum area. Breaking through these barriers is a new wireless audio transmission system that offers integrators the flexibility to seamlessly install custom audio systems for a wide variety of home and business applications. The award-winning PeerSound™ Wireless Audio System (ADS100-B) gives professional integrators the ability to customize wireless audio installs based on the exact setup of a home. No matter the project type, PeerSound™ offers a useful set of features not available in any traditional distributed audio system – saving professional installers and integrators money on wiring, reducing man-hours, and eliminating the need for multiple wireless audio systems on an installation. PeerSound™ takes a new approach that opens the door for robust and reliable multi-zone wireless audio. The industry’s first rack-mountable system, PeerSound™ allows professional installers and integrators to send up to eight channels of audio wirelessly to receivers (up to 140 feet away) to areas that are difficult and/or costly to run speaker wires while delivering pro audio quality sound reproduction for enhanced musical fidelity and performance levels (48 KHz 16 bit), exceeding the standard requirement. The eight channels can be utilized in whichever combination they are needed such as stereo and mono combinations for surround sound as well as mono zoned audio distribution with one system and no extra configuration. The Peersound™ system is designed and built with high quality, name brand technology that meets the criteria as a robust technology system, offering features such as Forward Error Correction, zero latency, Under Voltage protection, Short Circuit protection, Overload protection, Overtemperature protection, and stand-alone protection recovery. 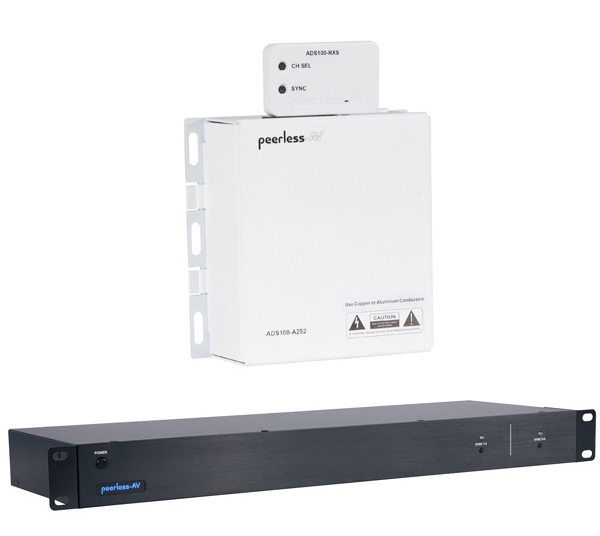 Additionally, PeerSound’s™ Wireless Audio System’s primary components – the 25×2 amplifier and eight-input rack mountable transmitter – work with virtually any pre-amp audio source and speaker, including retrofits, providing integrators a variety of installation options to ensure not only that the job gets done, but that it gets done right. Plus, the PeerSound™ ADS100-A252 amplifier with receiver is the only wireless audio system with the UL 2043 Plenum rating today. Installers work with AV racks every day, the wireless audio system should also integrate with an AV rack. Installers hide wires for the benefit of the customer, the wireless audio system should stay hidden as well. The customer doesn’t want to see equipment or wires. PeerSound™ was designed to work in this environment making both the installer and end customer satisfied with the hidden in-wall or on-wall amplifier, as well as a transmitter that installs in a AV rack. Wires will always be needed to hook devices up to a power source, but they are no longer essential for delivering sound. Wireless home audio has become a new option for pro installers to explore when opting for a high quality audio system. With systems available that deliver audio quality better than the CD standard, no longer will there be compromises when wireless options are looked into. And by having a system completely agnostic to the source and the speaker, installers can now offer the same level of performance when adding to an already existing system that allows a profitable job for them and a level of quality the client demands. Todd Mares is the Application Field Engineer for the Emerging Technologies Divsion of Peerless-AV, a provider of Professional Audio and Video Mounting Solutions, High Definition Wireless Delivery Solutions, and Professional Outdoor Display Solutions for Residential and Commercial Applications.